We are often asked how to merge two folders. This can mean one of two things: keep the calendars separate but view them as one using calendar overlay or combine them into one folder. If you use Outlook 2007 or Outlook 2010 and a day, week, or month view, you can overlay two or more calendars by right-clicking on the calendar folder and choosing Overlay. You can also click the small arrow in the calendar name tab to overlay or separate. If you have meetings on the second calendar, you need to use Move to folder, not Copy, in order for updates to work correctly. If you really want to merge the calendars, it's easy - use a list view then drag the items to the other folder. Or use the Move to folder command. It doesn't matter which type of Outlook folder you are using, the method is the same for all folders. Begin by selecting the folder you want to stop using. If its a calendar folder, switch to a list view, such as All Appointments or By Category. In Outlook 2010, it's called List view. In Contacts, use Phone list view. Click on one item, the press Ctrl+A to select all. Use the Move to folder (or Copy to folder) command or drag the items to the folder you want to move the items to. 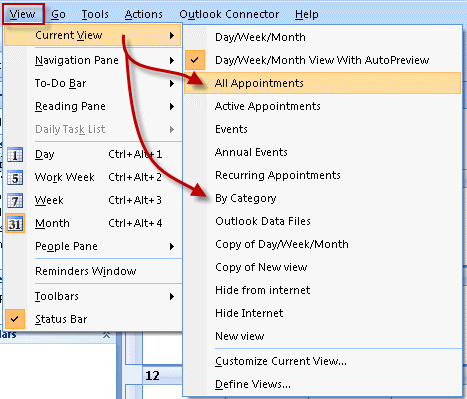 In Outlook 2010 and newer, choose List view from the Change View menu on the View ribbon. In Outlook 2007 (and older versions) use All Appointments or By Category. In contacts, use Phone list or By Category. How to merge or combine multiple pst files into one. I'm using Windows 10 64 bit and Outlook 2016. I installed I cloud but don't like the fact that my contacts and calendars are no longer accessible from outlook and would like to reinstall them. I've read the blog posts about copying from Icloud back to Outlook. I can "Select All" contacts from Icloud but I dont see any way to copy them? There is no "copy" prompt anywhere I can find. I also signed out of Icloud and thought if I did that contacts and calendar would be restored to outlook, but that didn't work either. What am I missing? I have not been able to sync my iCloud(2) calendar, or even access it, from either my cloud Outlook (on home computer) or my installed Outlook (on work computer) for some time. "Sync your settings" is greyed out. I was using iCloud Calendar(2) and it synced, but stopped several months back. Now iClould calendars won’t open at all in Outlook, I have to use 'Calendars from iCloud.' No opening, no syncing going on, and I can’t do any of the small fixes suggested in Slipstick. I am on the cloud Outlook at home (now) and none of the suggestions work. The installed Outlook at work, same lack of syncing or being able to open iCloud—same issues as noted above for the cloud Outlook. You signed out of icloud and signed back in? Delete the icloud data file from outlook (file, account settings, data files) too, before signing back in and that *should* fix it. If not, verify that icloud addin is enabled in addins - and stays enabled when you reboot. There's supposed be two backslashes in front of Outlook1 and one backslash between Outlook1 and Calendar, The same with the archive. But in this forum it just put them together. Sorry for so many posts. It didn't post it the way I wanted. I have multiple Outlook Calendars from way back, my PST file is named: Outlook1.pst. I have a calendar at \Outlook1 and I have another at \Outlook1Calendar. Which one is the standard default location? I'm on your page learning how to combine them into one, and delete the other. I also have multiple archive calendars at: \archive and \archivecalendar. Thank you very much. It helped me and solved my troubles! Will this work if one of the email accounts does not have a calendar? If the non-calendar email account receives a meeting request, can the calendar of the primary account handle incoming and new calendar events from the non-calendar account? yes, it should work just like that. I manage 3 separate calendars. Is there a way that when using "scheduling assistant", you can see conflicting time from all 3 calendars? This is more of an issue when others are attempting to invite me to a meeting and can only see busy periods from one of my calendar, not all three. Free/busy (which is what scheduler reads) only works with the default calendar in the mailbox.